Oh Claudia... We miss you! 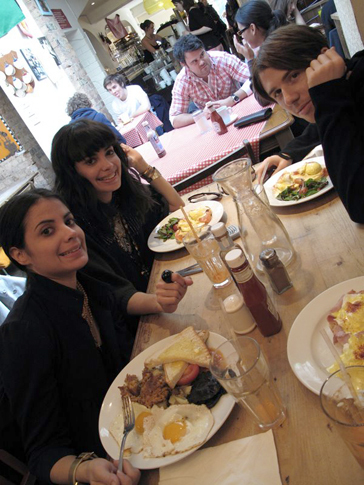 A few months ago, we splattered the return of the New York trio, School of Seven Bells across the site – their Disconnect From Desire album, their tour diary oh, and that interview about horror implicated suicides. Well we didn’t want to spoil you greedy bunch too much - so we put on the back burner the band’s run down account of their second album. Delivering with some serious elation, songwriter and lead vocalist Alejandra Deheza (with the help of Benjamin Curtis whispers) surrendered their POV on the tough sentimentality of certain tracks, 80’s vampire icons and how the bible is a real inspirational winner. Alejandra Deheza (vocals and guitar): I remember hearing that opening mantra while we were crossing the Alps. It was bleeding through Benj's headphones. The repetition of it really inspired me. It got me thinking about cyclical winds, graceful chaos, [and] fire disappearing into air. Alejandra: This song always sounded like a mini film to me. I just kept thinking about super rain slicked asphalt, motorcycles, LOTS of movement, LOTS of drama. It has a very The Lost Boys feel. Alejandra: I love that howl in the beginning of the song. [It] sounds like the earth is opening up. This one came together in Barcelona; we just had an epic show in Madrid and were still high from it. The Madonna toms are my favorite part of the song. This song is like a banishing. Alejandra: It was really hard for me to write the lyrics for this one. They’re so bare. It’s still hard for me to sing it and not feel completely exposed. Alejandra: Love the guitars! They’re so driving; they make perfect sense with the lyrics. This girl is super confused about her relationship to everything, her past, her present. The only constants in her life are the day and night, sun and the moon. These things are what she can rely on and she goes for it with full force, falling and getting up, crashing and getting up. Alejandra: I love how lush this turned out. It sounds like an electrical storm to me with clouds in every color stewing together. Alejandra: Probably the most bizarre smack talk song ever, but smack talking between spirits - one entity psyching the other one out. A far out pantheon of deities comes to mind. Love the synths in this one and especially that crazy vacuum guitar riff. Alejandra: The lyrics for this had been around for a while. This song was based on a dream I had maybe five years ago about walking through Chinatown. I remember feeling super isolated at the time, and this really helped. It’s pretty self explanatory - straight from my notebook. Love the guitars on this too. They’re subtle killers. Prince was right: joy in repetition. Alejandra: This is probably my favorite song to do live; I loooove the groove. Benj really blew this one out of the water production wise. All the Old Testament imagery just adds to the effect. It conjures up pictures of sandstorms and blue tinged, slow moving scenes from a movie about love lost. Alejandra: This is the last song we wrote, but oddly enough also the first song we wrote. These ideas had actually been around for a few years. It seemed symbolic of our time together as a band.